cable | Kaleido by Silkie B. Although it’s a couple months late, but I would like to introduce my Snow Time Hat Design that is currently featured in the Interweave holiday gifts 2012 issue. And this will be my last magazine publication this year and may be next year. Not that I am no longer knitting or designing, the truth is that I simply don’t have enough time due to my family commitment and work situation this year. The Snow Time Hat is worked in a round without any shaping on the top. The top is enclosed using grafting technique to give a seamless look. The pom pom detail is optional. And the snow time hat is best to work using fine weight yarn. The pattern offers 3 sizes, and the finished Size is approximately 12¾ (14½, 16½)” circumference and 6½ (7, 7¼)” tall. The Size small will fit an infant from 0-6 months. Recently, I have contacted by someone from Austrian Knitting Addicts group in Ravelry that would like to get permission from me to use my designs for one of their initiative. My Snow Time Hat design is one of pattern that they would love to use. Some of the knitters from the group are currently organising charity knitting for the Austrian Childhood Cancer Organization. Some of the projects will directly be given via the parents’ initiative to the little patients at the children’s oncological station at St. Anna hospital in Vienna; then what remains will be sold at the Christmas market in the hospital. I was actually happy that they contacted me and interested in my designs. I have requested to have some pictures taken so that I can share in my blog about this wonderful project. So stay tune for more information about this charity event. My very first pattern for the Accessory Collection 2012 is live!!! I went home that night and started sketching the design. I know that I wanted something simple and classic. I also wanted the legwarmers to be a nice compliment to an outfit but not to over-power it. Therefore, I decided to keep the main body of the legwarmers simple and jazz it up with other design elements such as side buttons enclosure and the lace trim. The final product is better than what I expected. The height and circumference can be varies depending on personal preference. The legwarmer will stretch and add up to 3-4 inches to the finished circumference. The pattern included the detail instruction for the pattern and all the related charts. If anyone is interested in the pattern, it is now available at Ravelry.com in PDF format. Besides working on my very first kids collection this year, you may be wondering whether or not I will have a accessory collection for this year as well. And the answer is a big ‘YES’. You kidding me! I love knitting winter accessories.. I am planning on some mittens, scarf, hats and socks design. 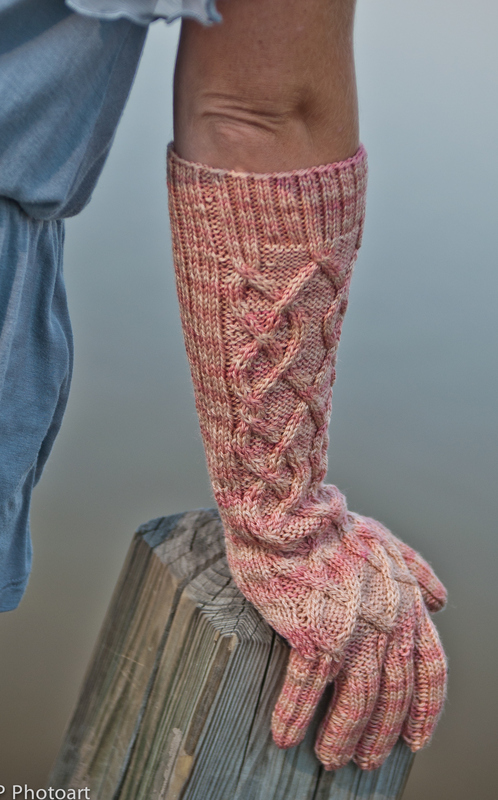 Above is my very first design, Suzanna, a legwarmers design features twisted rib, small cable rib, buttons side enclosed and stretch ruffle trim. The legwarmers measures 19.5 inches in height and stretch up to 15 inches in circumference. The pattern will be written in 2 sizes, one for kids and one for adult. Stay tunes for the pattern in the next 2 weeks. A big thank you to my talented friend Suzanne at SP Photoart for taking the pictures. One side note, I have people emailing me and wanted to know when the pattern for Taylor is available. I am working on the written pattern; hopefully, by the end of the month. Please stay tune for more update. Happy New Year everyone!!!!!! I hope everyone has a wonderful holiday with friends and family. As for me, my dear sister Bonnie and her family spent the holiday at my house… It was wonderful time to catch up with each other. I have just realized that it’s really been awhile since my last post… say at least a couple of months. The truth is that I have been so busy at work that I have unfortunately put my needles on hold for majority part of last year. I did however manage to knit 4 pairs of Maneisha in a slight variation from my original design for my daughter’s dance teachers for the holiday. It’s such a fun pattern to knit if you have not check it out already. So what have I been up to lately. Well, I will be busy this month to finish up a couple pairs of gloves for the Fall 2012 magazine publication and that will most likely be the only design that I will have for publication this year. I will be providing 2 versions of my design; convertible and full gloves version as you see below. Thank you Suzanne at SP Photoart for taking the wonderful pictures and Amy for being the model. 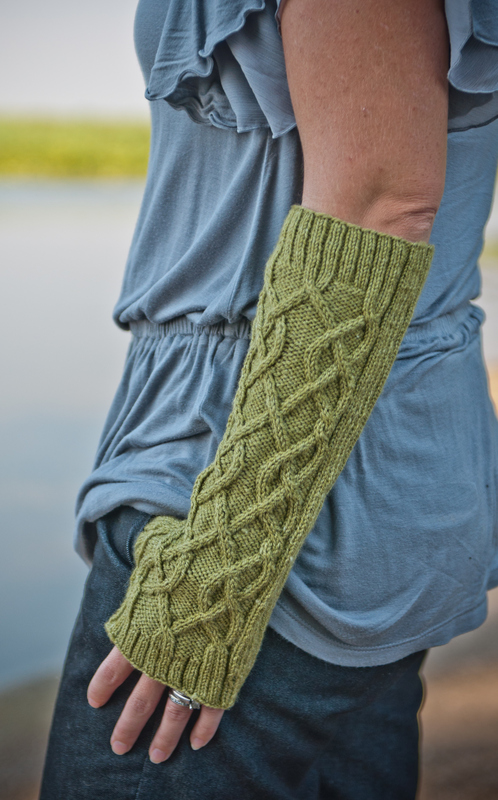 The sample of the convertible version was worked using one of my favorite yarn tern from Quince & Co in color sea grass; whereas the full gloves version was worked using a hand-dyed yarn from my friend Lindsey of Waterloo Wools. After I finish my commitment to the magazine later this month, I will start my big project of this year. You might be wondering what my big project is. Well I will finally start to work on my very first kids collection. I actually have started the project last year; a couple of designs has finished but missing the actual written patterns; some of the design has swatches and most of the collection will be worked this year. 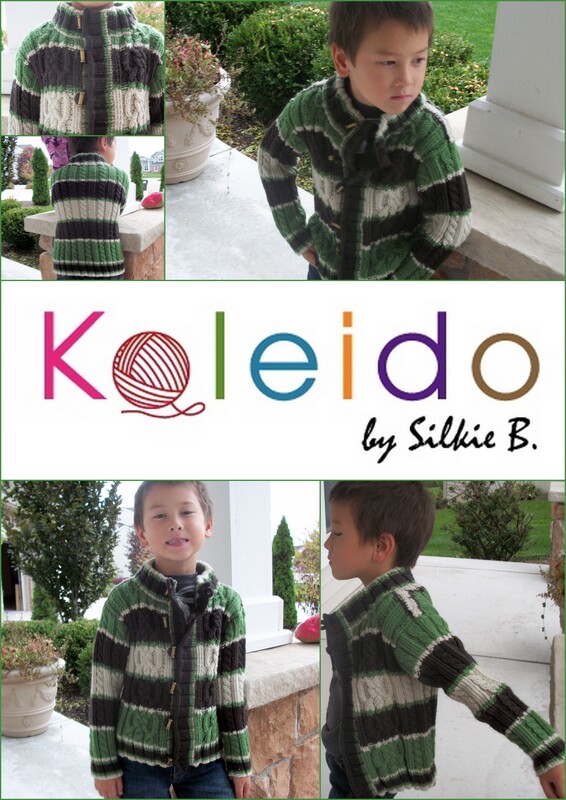 My kids collection will feature knitwear and accessories from the little tiny to teen. It’s a very ambitious project but I am sure it will be a lot of fun! First of all, I would like to introducing my first design for the collection – Taylor. 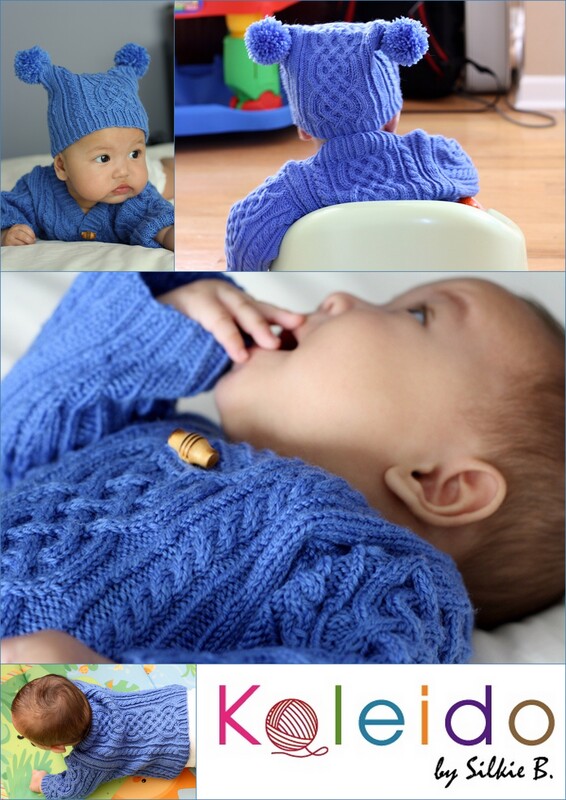 Taylor is a cap and sweater set for a baby; the pattern will be available from size 6 mos to 4 years. I designed this set for my friend, Glenna’s god-daughter who has given birth to a baby boy this past August. Taylor features celtic cable as the main center motif and I paired the cable with variation of cable rib. I have so much fun designing and knitting the Taylor set this summer and is very excited to include this design as part of my kids collection. A special thanks to my friend Karen K for taking the picture and have her baby girl Nia as the model. Another design for the collection is Isaac. Isaac is an unisex cable cardigan design for your boy or girl. 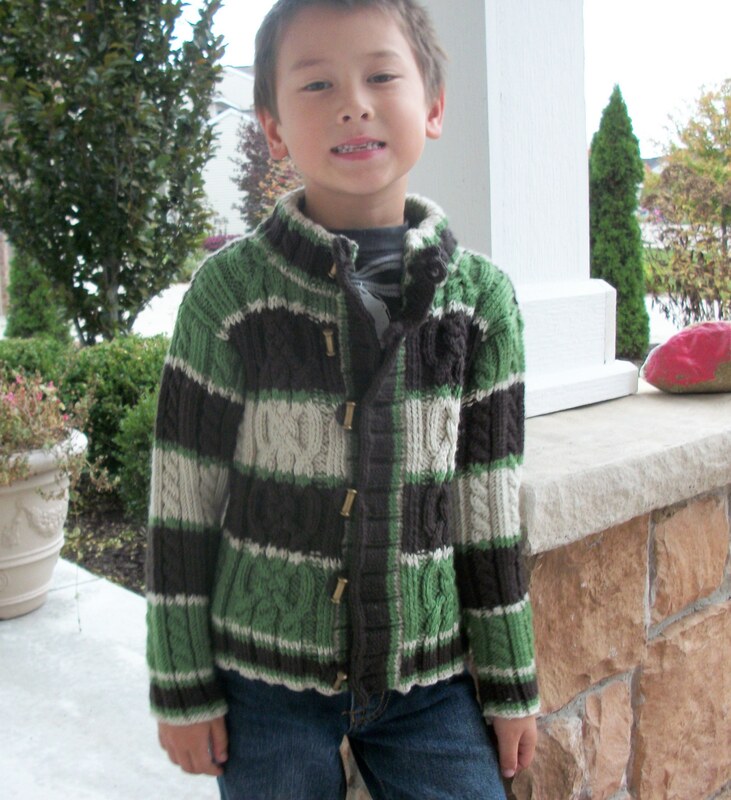 I designed this sweater with my son Isaac in mind. I don’t normally like to mix colors but with this particular design, I actually decided to play with colors. I love cable for winter sweater and it’s not surprising for me to incorporate cable into this sweater design. Isaac also features mock turtleneck and button enclosure. There is no buttonhole on the body band; hence the possible for the front enclosure is versatile depending on individual preference. The pattern for Isaac will be available from 4 to 10 years old. I will keep updating on my collection throughout the year… so stay tune! Reese is a cable scarf and Beanie set is for all ages and gender. It’s a prefect holiday gift for anyone. Reese Beanie has 2 sizes. Small size for kids and Large size for adult. Yarn: Rustic Tweed by Queensland Collection (63% Wool, 27% Alpaca, 7% Acrylic, 3% Viscose; 278 yd /100 g) Color: Medium Olive (912); 2 skeins. NOTE: Substitute Rustic Tweed with any dk weight yarn that maintains the same gauge. In addition, depending on the length of the scarf, you might need more yardage of yarn. Scarf: A set of Size 6 (4.00 mm) needle or 32 inches circular (cir). A 29” size 6 (4.00 mm) circular needle for crown shaping using magic loop method. The pattern includes detail written instruction, tutorial for magic loop method and attached i-cord, and all charts. If anyone is interested in the pattern, it is now available at Ravelry.com. I would like to introduce Serena – Another design for my Accessory Collection 2011 along with Maneisha. Serena is a cable cowl that is a perfect accessory for the cold weather. It is also a perfect gift for someone you love during the holiday season. Work in worsted-weight yarn and features interweave cable panel pair with 6-sts cable rib that is perfect for both gender. Height: 8 inches tall but can be varies depending on each individual preference. Yarn: Worsted Weight Yarn – 390 yards minimum for size stated above; more yardage will be required for a taller and wider cowl. Ribbing – Size 7 (4.50 mm): 46 inches circular (cir) needle. Adjust needle sizes to obtain the correct gauge. Main Body – Size 8 (5.00 mm): 46 inches circular (cir) or longer. Adjust needle sizes to obtain the correct gauge. Note: If the gauge does not match exactly like it stated in this pattern is not that important. A circumference of the cowl is very much depending a personal preference. The pattern is available in PDF format and pattern included the detailed instruction and chart for the Interweave Cable Panel and 6-sts Cable Panel. If you are interested in Serena, the pattern is now available via Ravelry. To View More pictures of Serena, Simply clicks on the image above.